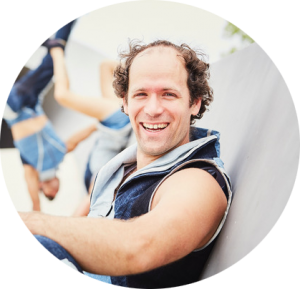 Company Satchok is a dynamic collaboration between three circus artists. The company unifies skill/technique in partner acrobatics, badquine and aerial straps, with a competitive attitude, humor and joy. Inspired by the ancient myth Sisyphus, they have created a show combining all these elements. Sharing the idea that the process is just as (or more) fulfilling than the result, the show is about pure joy and the fun of doing! Trial and error, concentration and mutual trust; The three artists present their skills up to the limit of human capacity. The show Sisyphus is made for street- and open air festivals, and thus has a very open and communicative character. It is about 20 minutes and perfect for all audiences. Company Satchok is a dynamic collaboration between three circus artists; Galatée Auzanneau [FR], Marius Pohlmann [DE] and Camiel Corneille [NL]. Originally from Geroldstein [DE], and now living in Nornhorn [DE], graduated in 2012 from the Circus Bachelors ACAPA in Tilburg [NL]. Marius loves good food. From Auch [FR] but now living in Barcelona [ES], graduated in 2012 from the Circus Bachelors ACAPA in Tilburg [NL]. Galatée loves a nice drink. Born and raised in Utrecht [NL], graduated in 2015 from the Circus Bachelors CODARTS Circus Arts in Rotterdam [NL]. Camiel loves a good game.